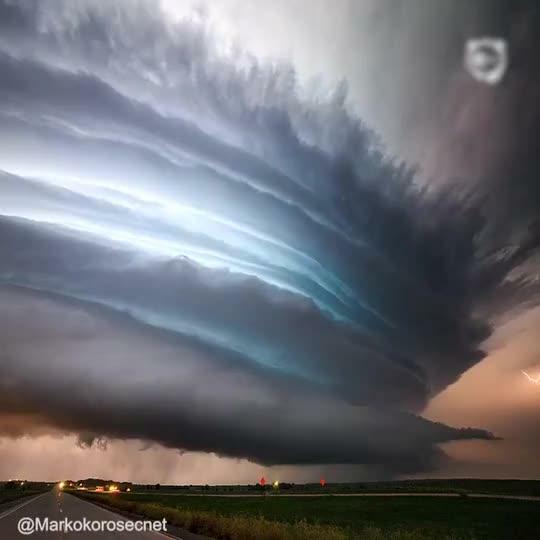 This Tornadic Supercell Above South Dakota Is Probably The Most Beautiful Storm Ever Captured | SAYWHAAATTT?! This Tornadic Supercell Above South Dakota Is Probably The Most Beautiful Storm Ever Captured – SAYWHAAATTT?! Most people avoid storms but Marko Korošec isn’t most people – he runs towards them. “Since my early age, I am interested in meteorology and photography,” Marko writes on his website. “During my primary school classes, I’ve already had some basic meteorological instruments for weather observation <…>. My interests have been rising since then and I found the most exciting moments in extreme weather such as damaging winter storms, severe storms during summer, excessive rainfall events during spring, etc.” One summer Korošec chased down a massive supercell thunderstorm in South Dakota. Under the right weather conditions, supercells can occur anywhere in the world but they are mostly found in the central part of the United States. It is regarded as the rarest type of thunderstorm and has the potential to be the most severe as well. These rotating nature giants can dominate an area of up to 20 miles (32 kilometres). This particular video clip was created by Marko’s friend Jonathan Wennström, who turned some of the photographer’s most astonishing images into an animated GIF.